Time to go eco-friendly with your disposables? - Nisbets Australia Blog - Industry news, trends, recipes and more! Waste in Australia is an increasing problem. With it ranking fifth worldwide for the waste it produces, per person, consumers are fast becoming aware of the consequences on the planet. 53% prefer to buy from a company with a green reputation. Now is the time to go eco-friendly with your disposables. Non-compostable materials are damaging our planet at an ever-increasing rate. Australia produces 18 million tonnes of waste a year. This rate is having a devastating effect on our environment. The effects are becoming more apparent as the years go on. Plastic is the most damaging; it takes around 500 years to decompose. It is harming the environment and animals, killing around 100,000 yearly from them ingesting or becoming entangled in such materials. The extent of our waste is resulting in it continually polluting the land and the air, which can cause respiratory problems and health effects for humans. With the increase of waste that humans are ploughing through daily, these effects are only increasing. This will continue to cause damage to human, animal and marine life. Using plastics in your business is unavoidable. Whilst there are many products that are only available in non-compostable materials, there are lots of eco-friendly options available. Every use of these composable products help the world around you and it is important to make an effort where possible. Bio-degradable products that are able to help combat these problems. When finished with they break down naturally by the action of biological organisms and processes. It takes 65% less energy than products of a traditional plastic process. Most importantly, these products degrade between three and six months - a rate incomparable to the synthetic equivalents. You are able to make a positive impact. Bio-degradable products are readily available for you to use in your business. 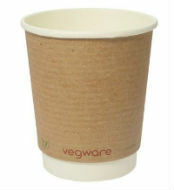 Vegware offer a large range of products that completely compost in the earth after use. All products are made from recyclable or renewable materials. Vegware products are practical, stylish and economic. Best of all, they help in reducing your carbon footprint. As Australians use over one billion coffee cups a year, it is important to have cups that are bio-degradable. This doublewall hot cup is an excellent product for your teas, coffees and hot chocolates. It is lined with plant-based materials and has a double wall design for superb insulation properties. These cups also have a solid base which is great for outdoor use. These cups are printed with "This is no ordinary cup. The paper is from a sustainable source, and the lining is made from plants not oil" on the bottom, making your customers visually aware that you are helping the environment. environmentally friendly, they are great for the food contents. Both products let the food breathe, meaning the food does not become greasy or damp. Your customers will be happier with their food as it doesn’t turn soggy when they come to eat. These biodegradable knives, forks and spoons are the perfect partner for the take-away boxes. They are all made from renewable corn starch and have both the look and strength of plastic. All three of the products available have heat resistance up to 85ºC - perfect for eating hot food. These super strong and environmentally friendly products decompose in around 47 days. Meat skewers are a must have for your barbecue meat. Bamboo skewers are a great and environmentally friendly option compared to wood. When bamboo is harvested the plant is not killed, compared to wood where the trees are chopped down. There are three skewer sizes available and bamboo makes them one of the most economically responsible options available. The looped ends provide an easy to hold handle for your customers. Consumers have a growing environmental conscience. Recently around 1,000 consumers were surveyed by Blueshift Research about going green on a range of topics. One of the questions was about how likely they would buy an eco-friendly product, even if it was more expensive. 90% said they would. Switching to eco-friendly disposables helps with your branding too. It indicates to your customers that you care. Whilst slightly more expensive, most people are willing to pay for eco-friendly items. Eight out of ten employees prefer to work for an eco-ethical organisation, indicating a growing conscience both inside and outside work. By using eco-friendly products, you are able to build a caring brand which attracts customers and recruits and retains a strong workforce. 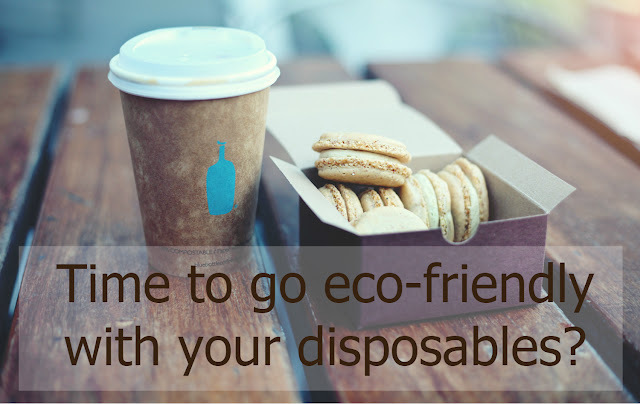 If you have been considering eco-friendly disposables, then now is the time to start using them. These products may be slightly more expensive, but they have lots of benefits. The most apparent being the environment – it is time to take action to look after the planet and its inhabitants. Whilst it is unavoidable to use plastic for some products, switching to eco-friendly versions where you can is a massive step forwards.